The San Francisco Mint has produced the coins for the collector proof sets. San Francisco Mint state quarters are used in proof sets, with the Denver and Philadelphia Mints producing the state quarters for general circulation. The 50 States Commemorative Coin Program Act was passed by Congress at the end of 1997 mandating that a special circulating coin program be designed to honor each of the 50 states. The goal of the new law was to provide coins with history-rich designs that would be fun to collect by young people and families. The details of the law included the direction that coins honoring five states would be introduced into circulation each year, from 1999 to 2008. This required the introduction of a new state quarter design about every ten weeks. A schedule was developed to release the newly-designed coins in the order in which the states were admitted into the Union, starting with Delaware quarters to be released in January 1999 and continuing through Hawaii quarters which were scheduled for release in June 2008. The law required that coins be designed with one side depicting something special about the state being honored. States were encouraged to provide designs from their local artists; however the actual coin engraving and minting would be completed by the Mint. The San Francisco Mint was selected as the production site of the proof coins and commemorative sets. This is consistent with the enactment of the Coinage Act of 1965 which designated the San Francisco Mint as the primary production facility for coin sets and commemorative coins. The quarters used in these sets have an "S" stamped on each coin. The Mint is located on Hermann Street, about two blocks from the Duboce and Church MUNI station. A "proof" coin is described by the Mint as a process where "specially-treated coin blanks are struck multiple times using specially-polished dies. Proof coins … are extraordinarily brilliant, with sharp relief and a mirror-like background. 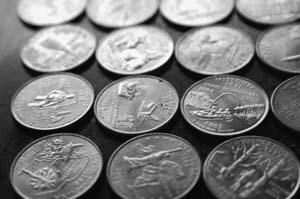 A frosted, sculpted foreground gives these coins a special cameo effect." The San Francisco Mint does not provide tours, but there is a video tour available on the Mint's website called How Collectors Coins Are Made. This video tour shows how coins (both circulating and collector) and proof sets are designed and produced. Since 1999, the San Francisco Mint has produced a variety of collector's sets of the five quarters which were produced and released in each year. Sets were produced in both silver and non-silver versions. These sets are not available for purchase at the San Francisco Mint, but they are available for purchase directly from the United States Mint either online or by calling 800-USA-MINT. There is detailed information available online from the United States Mint about the 50 State Quarter Program. There is also a Mint-sponsored educational site that includes lesson plans for teachers.